Hikers travel along the Gulkana Glacier in the Alaska Range mountian. 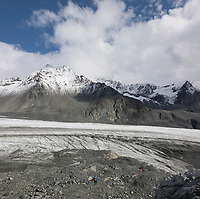 Sweeping panorama of Gulkana Glacier in the Alaska Range mountains. Landscape of Gulkana Glacier, Alaska Range mountains.